Totally private, sprawling, one level Mid-Century Modern three bedroom two bath home, on two woodsy and beautifully landscaped acres of 50 year old azaleas and camelias in Southern Pines, NC. You can’t see any neighbors - its like being in the country, yet minutes to downtown Southern Pines and Pinehurst Village. Totally quiet and peaceful, a bird lovers paradise. Top of the Hill was built in 1958 and designed by Thomas Hayes, an architect who taught at NC State at the time. It is featured in as an example of North Carolina mid-century modern architecture. Furnished unlike any vacation rental house with four generations of family antiques, art, and collectables. Quality beds, sofas and upholstered pieces. Cooks will be delighted by the large and very well equpped kitchen and library of cookbooks. This is my second home and as such it reflects my interests in design, architecture, gardening, cooking, entertaining and living well. I hope you enjoy it as I do! The main living areas have original redwood shiplap ceilings and terrazzo floors. The living room has a wall of glass providing stunning views of the Pines, deck, gardens and sky. The kitchen in all new and equipped for the serious cook or entertainer and every convenience for guests on the go. The laundry room has new front loading washer and dryer. The foyer has glass walls that create a space that seperates the bedroom wing from the bedroom wing, and a view of a Japanese garden. The dining room seats 6-8 and opens to a side patio with propane grill. The bedroom wing is carpeted, each bedroom is very well furnished and equipped with every convenience. The beds are all high quality and linens are provided. The grounds are stunning with 50-plus year old plantings by a Landscape Architect who worked with Thomas Hayes. There is a bocci set, a big deck with dining table and lounge chairs. There are two drives, one to the garage (garage no included) and the other very large drive for guests proving parking for ten or more cars for a party. This home has just been repainted inside and redecorated with valuable family antiques. I am only interested in sharing my home with people who will respect it and treat it with care. Top of the Hill is a unique,stylish and fun property located minutes to Broad Street, (the main street of Southern Pines) where there are many excellent restaurants and shops, and ten minutes to the center of Pinehurst Village. I am a Fort Lauderdale native and a Realtor in that area. My family is from coastal North Carolina. Top of the Hill is my second home. Furnished with family antiques, art, books and other beautiful and things not usually found in vacation rental homes. I hope you enjoy it as much as I do, and past guests have. I love the small town atmosphere of Southern Pines which was founded as a resort town after the Civil War. Of course the big draw here is golf, but for me, being an hour from a major city (Raleigh) and hours from the beach and the mountains makes this ideal. Top of the Hill is a unique vacation offering in Moore County, being so close to everything but on a two acre lot provide peace, quiet and privacy. Lots of birds and deer are often seen in the yard. This is one of three vacation homes in my collection, all of which offer comfort, charm and character in Southern Pines and Beaufort NC and Fort Lauderdale, FL. not normally found in vacation rental homes. 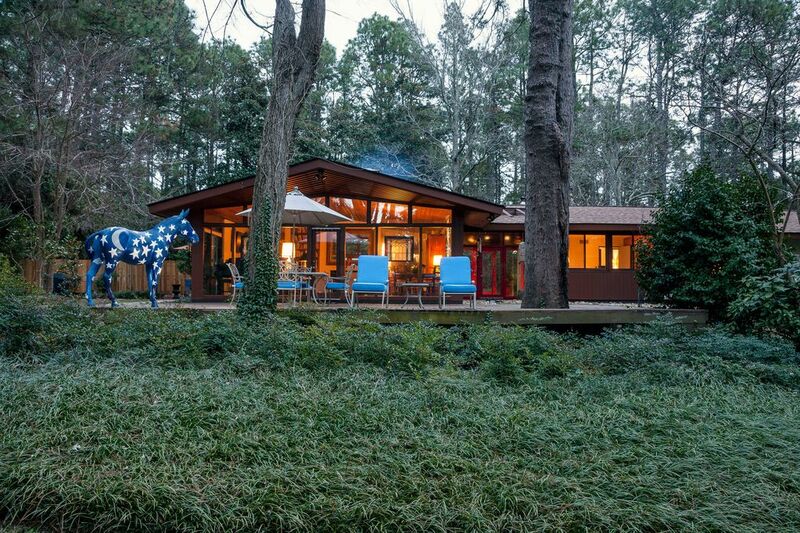 It surprises most people that North Carolina has the third largest concentration of Mid-Century houses in the US after California and Illinois. This is thanks to the design school of NC State that attracted architects and landscape architects of Modernism to thier faculty starting in the 1950's. This home was designed by Thomas Hayes, one of those Architects and is a true gem of its period. I love the mix of 50's modern with antiques. Watching the sun come up behind the Pines through the wall of glass in the living room is heaven to me! There is one bath in between two bedrooms at the end of the hall with double sinks and a seperate tub/shower and toilet. The other bath is in the hall across from the third bedroom. There is a toilet in the laundry room off kitchen. Downtown Southern Pines is five minutes away, with restaurants, bars and shopping. Pinehurst Village ten minutes away. The Pinehurst Resort and Spa is ten minutes away. Downtown Southern Pines is 5 minutes away. Great restaurants, bars, shopping. The Village of Pinehurst is ten minutes away. Huge fireplace in living room. Two driveways, lots of parking for guests. Yes, lots of quality towels. Beautifully furnished with antiques, two large couches, a round game table and 4 chairs, Bose sound system, Alexa, flat screen Smart TV, fireplace, awesome views of grounds and Pine forest. Double electric ovens, gas cook top and hood vented outdoors. Two electric ovens in range. Very well equipped with china, glassware, and stainless flatware for 12 or more. Teak dining table with antique chairs and corner cabinet and Chinese screen on wall, shelves, view of garden and patio with gas grill. Bose surround sound system in living room, Amazon Alexa in living room, kitchen and three bedrooms. Tivoli AM/FM radios in two bedrooms with iPod jacks. Bose system in living room with DVD player. Amazon Alexa. Lots of books and a great collection of cookbooks. A box of area guides/brochures under coffee table. Bocci, a set of golf clubs, disc golf discs, backgammon, cards, chess, checkers, and various board games. 2 acres of 50 year old plantings of Azaleas, Camelias, Magnolias and other Southern plants, lots of grassy areas and surrounded by Pine Forest. Huge deck off living room with dining table six chairs, and four teak lounge chairs. Great lighted public courts in downtown Southern pines 5 minutes away. Over 400 holes of golf in Moore County. The southern pines Country Club is around the corner with a historic Donald Ross course. A great play and not well known. They also serve breakfast and lunch. There is a 4 inch step at the entrances but otherwise all level and one floor. There is an awesome indoor lap pool at First Health Fitness center in Pinehurst. $10.00 a day to use everything. The best gym I have ever seen. There is also a community pool in Southern Pines. I am happy to provide restaurant and touring suggestions. There are some wonderful walks in the area. One of the secrets of the Sandhills is the Donald Ross course around the corner from the house. Rated on of the best plays in the Sandhills. Great breakfast spot too. Owner gives extremely detailed instructions on how to use the home and how to leave it, but somehow omitted to notify us of the security camera (audio/video night vision recording dropcam) tucked behind the vases in the living room. We were recorded in the living room and who knows where else for 24 hours before I discovered it and unplugged it. I have 3 kids under 18 and am pretty sure this is illegal without my signed consent. If you like staying in a museum where you can’t touch the covered piano, hutch, grandfather clock, vases or paintings without a threat of being charged, then this is the place for you! There is also a camera on the thermostat facing into the bathroom. Not sure if that was active or controlled by the owner. If he’s comfortable recording us in his home, how many other cameras are hidden in the closets that have locks on them and you will be charged if you get into them. They have slats pointing down into the bathroom as well. We also had to pay an enormous fee for the 7th person when it’s advertised as sleeps 8. Long, extensive to do list and cleaning responsibilities before you can leave the property - on top of being charged an automatic cleaning fee. We’ve stayed in VRBOs before and this is extravagant. Creepy setup with an owner that isn’t up front about recording you and justifies doing it because of “security” and that it’s only used when the house is vacant. Right….. This is a glorified overpriced storage facility and a creeper trap. 1. Strip beds that have been used and put bed and bath linens in the hampers provided in each bedroom closet (don’t combine or mix bed linens between rooms). 2. Close patio umbrellas and bring outdoor cushions to living room. 3. Empty refrigerator (you may leave usable food items for next guests if you like). 4. Bag all trash and place in outside receptacles and move to curb. 6. Lock all windows and doors. 7. Be sure all TV’s are off. 8. Wash any dishes and cookware and return to cabinets. 9. Leave grill clean, gas tank off, cover on. 10. Turn off all lights. 12. Otherwise please leave the house as you found it. Wow. In over ten years of renting this house I have had nothing but positive reviews. The photos of the house online clearly show the high quality of furnishings that are in the house. Not sure why that was either a surprise, or a detriment to this guest. The check out instructions he quoted are not at all unusual, nor should they seem burdensome to anyone. He mentions not being able to touch certain things in the house. I have three small signs, one asking guests to use place mats on dining tables, one not to uncover a Steinway Grand Piano ( given as a gift to my stepfather upon his graduation and restored by Steinway recently ) and another not to place anything on an antique chest in the bathroom. Hardly unreasonable requests. Most guests are interested in the antiques and art in the house, appreciative and careful with them. Finally he mentions cameras. There are no cameras active in the house. There is one nest camera aimed toward the back deck that is in the living room that I turn on ( if I remember to ) as part of the security system of the house. I should let guests know it is there, and not on, and suggest they unplug it if they like. His suggestion that I have other cameras in the house, and in fact said he saw another one, is simply untrue. What he saw is a Lennox i-comfort thermostat on the bathroom wall. No camera. When people book a vacation rental, I think it is important to look closely at what they are renting ( including look closely at the photos), and read and understand the terms. My four vacation rental properties are all well represented in photos and descriptions, and guests have, if anything, been pleasantly surprised by what they find. This guest complained about the housekeeping fee ( less than what I actually pay for it) and being charged for additional guests ( clearly shown prior to booking) after he had checked out. Reviews should come with a certain responsibility from the reviewer for fairness. I just can't understand how this guests experience could be so totally opposite that of any other. Frankly I think this review is unfair and unjustified. I invite you to read the other guest reviews on this property, and three others that I own. Reviewing my house manual I see nothing that should be thought of as anything less than helpful and normal. Check out procedures are industry standard. The booking terms clearly state what charges will be incurred and the housekeeping fee prior to booking. We are a group of 6 cyclists who come every year in Pinehurst area for a spring training camp. This is the second year in a row that we stay at this place and we like it very much. This is a great location: close enough to Southern Pine and Pinehurst. There is a large back yard and you can't see neighbors. There are 4 beds but enough place to add one mattress. The house is beautifully decorated, well equipped with tons of amenities. You will find in the kitchen all the tools a real chef would required, including a nice gas stove. Beautiful patio with sun exposure all day long. We have been in a few places in that area and this house is definitely the best place we have been. We are looking forward to coming back next spring. We had so much to concern ourselves with moving into the nearby area...the last thing we had thought about was where to stay while the movers did their work. We happened upon Top of the Hill and although the movers were a nightmare, our stay at Robert's gorgeous home was a dream. The kitchen has everything you need to address special diet and cooking needs, the bedrooms are comfortable and offer abundant privacy, and every important accessory is on hand (Wifi, cable tv, quiet places to read and on). Phone conversations are made more enjoyable ambling through the spectacular backyard. The home is impeccably maintained and designed, all of which contributes to what will always be a calming experience amid the storm that may be raging in your lives. A find! My prior golf vacation rentals were in Pinehurst but this great house in Southern Pines has made me a total convert. The wooded setting is fabulous, you feel "away from it all" yet you're just minutes from downtown and Pinehurst and all the area golf courses (one of which, the Elks Club of So Pines, is about half a mile away and one of the best plays in the Sandhills). The house is spacious, bright and a great place for entertaining...both inside and out on the huge deck, and the neighborhood is upscale and a beautiful place to walk. I spent a month there and can't wait to return in the spring! My family just spend a long week in this home. We enjoyed it a lot. The location was perfect. Neslted up the hill but a very short drive to downtown Southern Pines, Pinehurst, Aberdeen etc or to all the wonderful local golf courses including Pinehurst.This home has a 60s feel but is confortable, spacious and well furnished. The backyard, hamac and foosball table were perfect for the kids. The kitchen is VERY WELL equiped which makes cooking easy for breakfast or dinner. Wireless DSL made is convenient for cruising emails or gathering local infos. Rob was friendly, always accessible and easy to deal with. I recommend this home for a family vacation, golf getaway. What a great house. Rob - thanks for a stress free rental experience. We had a great time enjoying the great combination of the bright living room, huge deck, and secluded backyard. All in all, it made for a very relaxing getaway. With over 400 holes of golf, Moore County North Carolina is the home of Golf. Southern Pines is a charming town of 10,000 people with a picturesque main street lined with shops, restaurants, a bookstore, and theater. Located 10 minutes from Pinehurst, Southern Pines is a step back in time. Golf: Moore County is the Home of Golf in North Carolina. Top of the Hill is located within 10-15 minutes of the Pinehurst Resort, Mid-Pines Resort, and many area golf courses. Check out Home of Golf dot com for more information.